RUSH: David in Pekin, Illinois. Glad you waited, sir. How’s it going? RUSH: Could not be better. CALLER: Great. This is a longtime listener, second-time caller. RUSH: Happy to have you here. That’s good. That’s cool. Thank you. RUSH: Well, wait a minute. What would you do if you didn’t get straight to the point? CALLER: Well, I’d like to chat a little while. RUSH: Well, then do that. What do you want to chat about? CALLER: Okay. Well, I’ve been a longtime listener and I’ve always been trying to get in from time to time. Last time I talked to you I told you how my dad got converted by listening to you from a lifelong Democrat to a Republican just by tuning in to you. Had nothing to do with me. RUSH: That’s amazing. That’s amazing. Well, you had something to do with it. RUSH: Yeah, that had to be great news for you. That was a way to go out. RUSH: And all it took was a little exposure to this program? CALLER: That’s right. Well, he never missed a program. He had a radio, you know, a transistor radio. He was out in the garden, he was listening to you. RUSH: Absolutely. Well, that’s great. Now, what was the point that you called about? CALLER: Well, I always wondered, you know, this Trump dossier, I mean, that was what was used supposedly to get the FISA warrant. Now, if that is subsequently proven to be a fake and paid for by the Clinton Foundation, wouldn’t everything that has been found out so far by the Mueller special investigation, whether it was true or not — (unintelligible) wouldn’t that have to be thrown out as fruit of the poison tree? RUSH: You know, this is actually, in legal terms, this is a fascinating, fascinating question. Because while we all think and we’re all confident that the dossier — well, we know the dossier was bought and paid for by Clinton. And we know that it was disseminated by Clinton associates. And we know that it was turned over by the FBI and they saw it. But proving that it was the only thing they used, man, it would be tough. But people have written about this. I have opined that if, as you describe it, all of this that happened is totally illegitimate. It’s all based on something that did not happen that isn’t. This is not legitimate intelligence. We have been hoaxed. RUSH: That last point that the caller made, I have asked that question myself actually some weeks ago now. It was I think may even back in November. But stop and think of this. We have this Trump dossier, which we now know none of it has been corroborated, nobody’s been able to corroborate any of it. We also now know it was bought and paid for by the Hillary campaign. Look at it as a work of art that was commissioned. The Hillary campaign ordered this thing to be written. It was an opposition research collection, and it was supposedly things that would consist of items to be used as an October Surprise, to find dirt on Trump. And a lot of it, the vast majority of it’s totally made up. And it was written as an intelligence document. And they titled it “dossier” to make it seem like it was really official, really, really, really official intelligence. And they hired a guy that used to work for MI6 to do it, British MI6. Their version of the FBI. Christopher Steele. And then they leak its existence, and it ends up in the possession of the media and James Comey, who shows it to Trump, and that then makes it a news item that can be covered, which is how they got the contents and the details out. And that dossier we now — we believe — see, we can’t prove because we haven’t seen the FISA application, but we think that that dossier was used to get a FISA warrant, Foreign Intelligence Surveillance Act warrant to surveil Trump Tower. Now, there’s another little bit of timeline news. 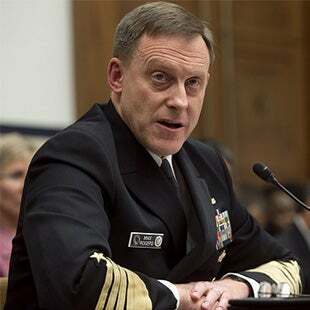 The director of the NSA is Admiral Mike Rogers. And in I think November, December, I’m not sure which, Mike Rogers visited Trump in Trump Tower. We don’t know what was said. But he’s military, and it’s kind of unusual for a military man, even though he is the head of the NSA, to jump chain, but he went and talked to Trump. And shortly after Mike Rogers spoke to Trump, Trump relocated his transition team out of Trump Tower and over to his golf club in Bedminster, New Jersey. Now, it is assumed by people who have been studying this that Trump was alerted, and then of course Trump tweeted a couple months later in March about how unfair it was that Trump Tower had been wiretapped. So the thinking is that somebody who had seen the dossier and knew about the FISA warrant gave Trump a heads-up and that Trump then moved everybody out of Trump Tower, moved his transition team headquarters to Bedminster, New Jersey, where his golf club is. So the question: Was it fake document created by the Hillary campaign as an opposition research document dressed up to look like real intelligence used to secure government permission to spy on the Trump campaign during the Obama administration? This would have all happened when Obama ran the DOJ and the FBI. And you put these people’s names, Peter Strzok and Lisa Page, his paramour, and all these other people that ended up on the Mueller team. So the question is obviously raised: If nothing in this dossier’s legitimate, if it’s all fake and phony and made up, and yet has formed the basis of this investigation into Donald Trump, what in the hell has actually, happened here? What in the world is really going on? The deep state, the administrative state, intelligence community, law enforcement is using fake, made-up news to use the justice system in this country, the DOJ, to spy on and investigate an opposition political presidential candidate. And now we have indictments. Manafort and these others have been indicted for things totally unrelated to the campaign as a result of this investigation. So the caller’s question is really, really important and legit. Just what is going on here, and how illegitimate is all of this? And to what lengths will these people go to get rid of Trump? And I think the answer is whatever it takes. But this is serious, serious stuff. To be able to make up anything you want and then have that used by the CIA and the Director of National Intelligence as the basis of an investigation into whether or not a candidate colluded with the Russians to tamper with the election system. And then a year after that gets going, we have a tell-all book that’s published, and one of the themes of the book is that Trump didn’t even want to win, that Trump didn’t expect to win, that Trump’s wife was in tears on election night because they did win, that Trump never thought he would, even on election night. Wolff’s book says even on election night they didn’t think they were gonna win. And they were expecting not to win. They were hoping not to win. They used the campaign for other things, Wolff’s book says. So what has gone on here. If Trump didn’t even want to win — and I don’t believe that — but if Trump didn’t want to win, then what’s he doing colluding with the Russians to steal the election? Which also didn’t happen. And in the midst of all this we’re being told that Trump is unfit and that Trump is unstable? Trump’s the only thing stopping this country from descending into a police state of sorts. Really, when you stop and think about it, substantively and with the timeline attached, it is scary. Now we’ve got this massive special counsel with 16 anti-Trump lawyers with an endless budget and no time limit, and they’re fishing for any crime they can find that any of these people have committed at any time in their lives. Doesn’t have to do with collusion, doesn’t have to do with obstruction, anything. I tell you, folks, this is perhaps, to me, the biggest political scandal in my lifetime, bar none. I can’t think of anything that’s even close. Watergate was a nothing burger compared to this. Iran-Contra was a nothing burger compared to this. This stuff is so outlandish the craziest scriptwriters could not conceive of this, because they would not think something like this possible. There couldn’t be a conspiracy involving this many people to keep it quiet. But when you have a compliant media that’s in on the gig with you, then the rest is easy.